Hello Guys! Today's post is going to be my November Favourites! Back at the start of September, my friend Annie and I went to the local Co Op after the gym for a few food essentials and we came across the reduced section! We found some little tin buckets in numerous colour and pattern variations and they were only 70p!!!! I instantly thought oooooo I could use them to store my numerous makeup brushes and they'd look so cute in my Uni room - so I bought them! They're probably aimed at young children, but I thought they were too cute (and cheap!) to just leave there on the shelf, so I've been loving them! I recently popped into Primark (my favourite affordable shop!) and noticed a pair of black suede heels for £6! I needed a new pair of comfortable heels, but in particular was looking for a pair of heels that had a slightly smaller heel height, but were still "big heels" (do you get me?) Basically, my boyfriend and I are the same height near enough when I've got flat shoes on and whenever we go on a night out together I'm ALWAYS taller than him!! All of my house mates are smaller than me too and I literally feel like the BFG so I thought I'd buy a cheap pair of shoes to wear on nights out! They are SO comfy and I'm not too much taller than my house mates so it's kind of a win win situation really! Go and check out Primark's heels because they're actually surprisingly comfy and of course cheap - great for any struggling students out there! I think this is possibly my number one favourite purchase from back in September! I've been searching high and low for the past year for the perfect winter coat with a fur collar and I ideally wanted a black coat, but when I walked into the Liverpool Primark store whilst I was at home before moving to Uni, I came across the perfect camel coloured fur coat and I literally ran at it! It is so pretty and definitely does not look like it's from Primark! 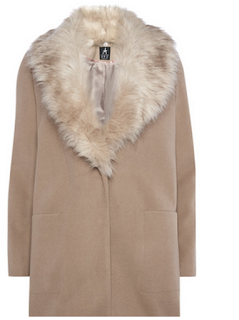 The best thing about this coat is that it was only £22! I couldn't resist buying it and I'm so happy I did. It's so cosy but it's also roomy enough to put a jumper on underneath too! Definitely go out and buy it if you like this sort of style coat! Throughout September my friend and I joined the gym and we went loads in September! Unfortunately this month has just been so hectic so we've not been as much, but we did a few classes in November which were really fun! I enjoy going because it makes me feel good about myself when I come out (even if it doesn't while I'm in there!) My house mates and I also did a few classes and we LOVE Zumba and Pilates! So there you have it, my October favourites! I seriously cannot believe that we're in November now! Time is going way to fast! What have been your favourites this month? Let me know in the comments!